Having twice been to the Grand Canyon, the combined physical activities of which consisted of bending over the railings and pointing the camera at the right direction, I was determined not to put another trip there unless I was sure I wont come back without breaking a sweat. An opportunity to uphold my decision presented itself when a brave hearted woman, Susan, organised a rim-to-rim hiking trip to the canyon. Although the trip followed a series of preparatory hikes, most of the participants met each other only on the eve of departure. The 30 of us who signed up for the trip left Los Angeles late on a cold Tuesday night hoping to have a fun filled hike across the canyon. None of us expected that most of the fun would happen not at the canyon, but to and from it! It all started with the mode of transport that we had for the trip - the Adventure Bus, which looked more like a Baghdad magic carpet than the popular four wheeler. The interior of the transport consisted of one big segmented bed and all of us had to choose a favourite sleeping posture and stick to it till the next morning. It was only in the morning, when we found ourselves not far from our homes, that we realised the fact about the speed (or the lack of it) of the bus. We were presenting the other oversized vehicles on the road the opportunity of the lifetime to overtake another motorised vehicle and all but one ram-shackled road roller gleefully accepted the offer. But what we lacked in speed outside, we made it up in the fun we had inside. The mode of travel (of sleeping on top of each other) forced all of us to get to know each other better, which would never have been possible had there been traditional seats. After spending better part of the next day huddled inside the bus, we finally crawled to the North Rim campground just in time to cook dinner and set up our tents. Our campsite permits on the hike were such that we had to hike down in smaller groups on different days following different itineraries. I chose to join the last group and thus gave myself a couple of days to explore the north rim. I found the north rim to be more beautiful than the south rim, although there weren't quite as many viewpoints and (thankfully) quite as many tourists. The Widfross point trail and the Uncle Jim Trail were covered as a part of the "exploring" process and preparations for the big one across the canyon. Gary, the fearless leader (or that's how he addressed himself), my flat mate Suraj, Jim, Rocky and myself were the members of the final group which left the north rim early Saturday morning. We were joined by couple more - Rudy and Dan - on the two days that we spent inside the canyon. The north rim is higher than the south rim by about 2000 ft and hence the descent from the north side is much steeper, which by the by was the reason our hike started from this side. We went down the North Kaibab Trail (14 miles to the river) and up the Bright Angel Trail (9 miles from the river). 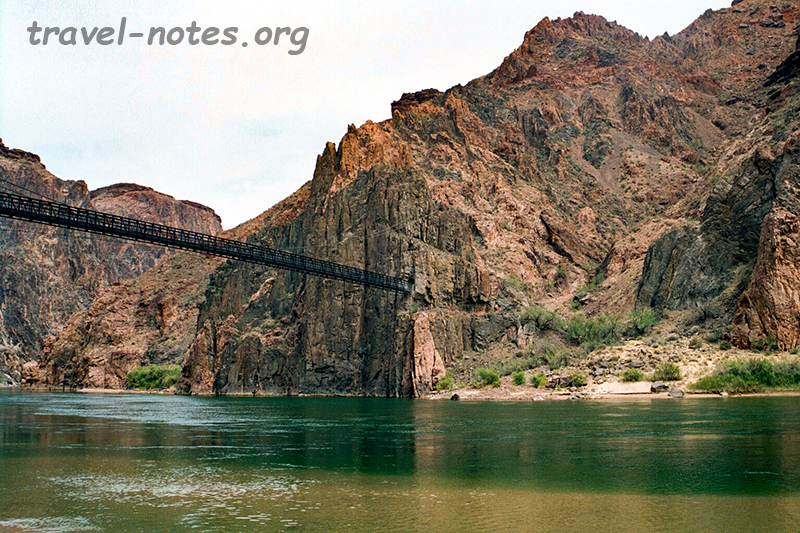 Thanks to Gary we had obtained the permits to stay at the Cottonwood (7 miles into the canyon from the north) and Bright Angel (at the river) campgrounds for the two nights. That left us with easy strolls and plenty of free time during our descent and a slightly hard ascent on the last day. The first group, for comparison, had to walk to the Indian Gardens on the first day, a good 20 miles from the north rim camp site! We spent most of the free time in the Cottonwood camp site at the nearby Ribbon Fall - a decent falls in a very pretty settings. The route between the Cottonwood and the Bright Angel campgrounds is the most beautiful section of the entire journey. 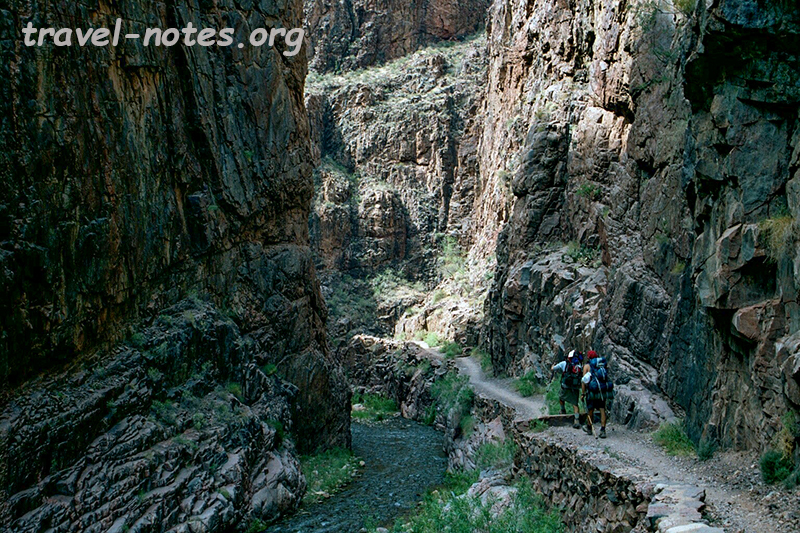 The trail runs all along the Bright Angel creek through a 7 mile long narrow canyon. 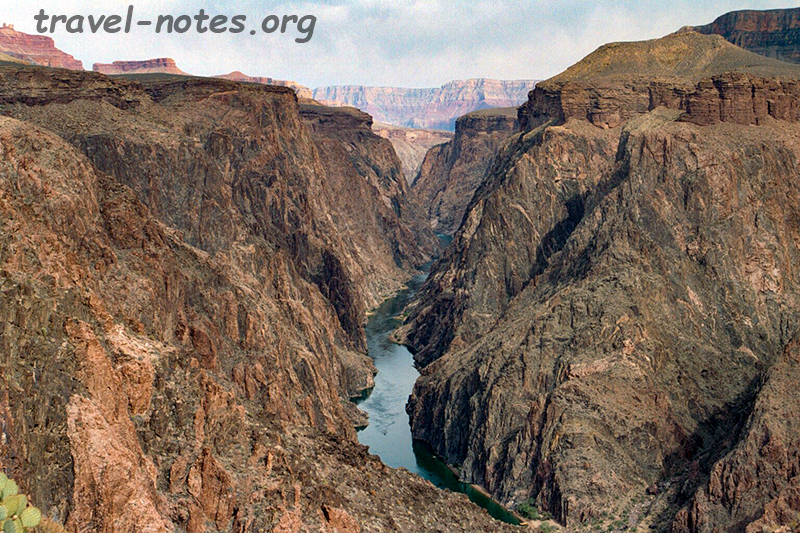 The scenery was quite spectacular especially due to the enormous size of the canyon walls. I had a perfect ending to the day when I unknowingly ended up at one of the most dramatic viewpoints while searching for the rest of group along one of the side trails. 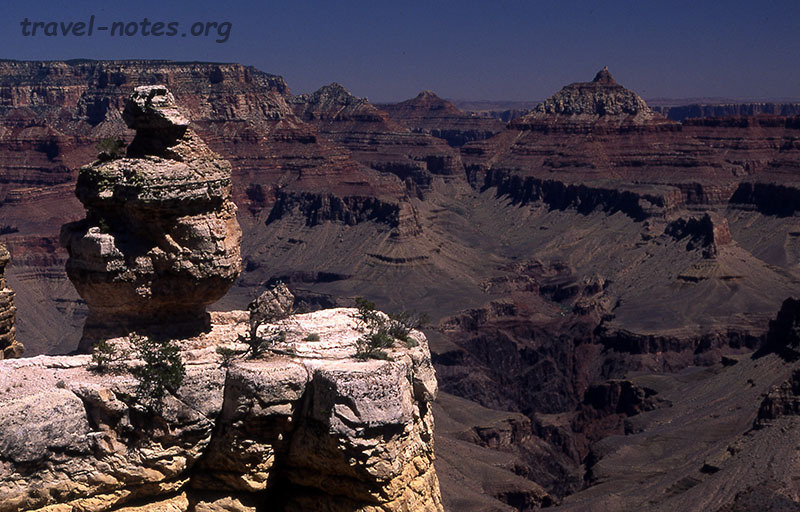 The view point offers a great panoramic view of a good portion of the inner gorge, the two south rim trails along with the two foot bridges. The clear creek trail which leads one to this overlook surprisingly was completely deserted and this point could be one of the best kept secrets of the region. A 6 hour hike up the Bright Angel Trail brought us to the south rim by noon on the last day. Except for the last three miles where the trail resembled a steep ladder, the hike was very pleasant. Another fun filled bus journey where we attained speeds which gave two snails and a tortoise a scare of their lifetime, we reached LA in the sleepy hours of Tuesday morning, giving us enough time to drive straight back to work. All in all, it was one of the best hiking holiday I have had in the US by one of the quaintest (and a certain must-do) mode of transport. 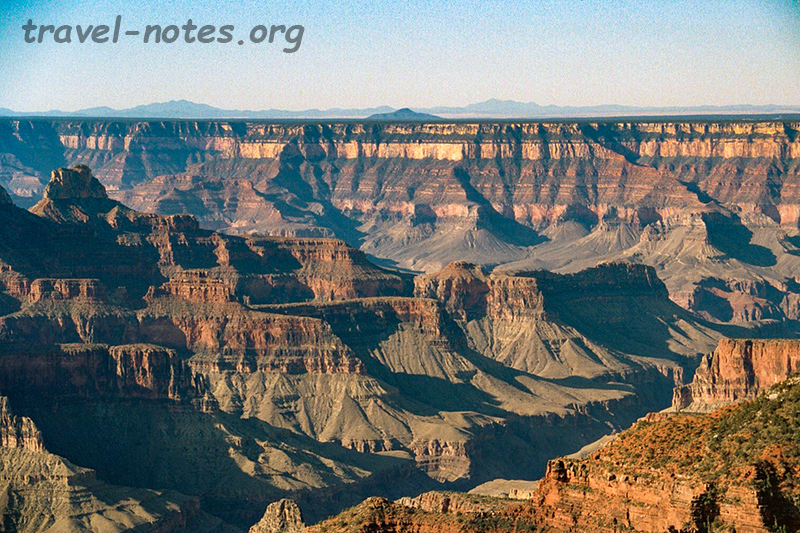 Click here for photos from the Grand Canyon National Park.